Celebrate Steamboat with a soak in one of the historic hot springs. It&apos;s the reason the town is here. Old Town Hot Springs is in the heart of downtown Steamboat while Strawberry Park Hot Springs is an adventure on the edge of the Yampa Valley. Both offer a relaxing soak and a refreshing dip into Steamboat’s colorful history. 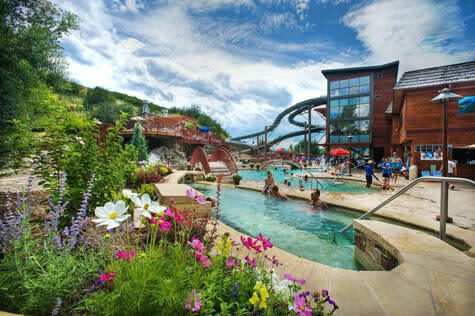 Whether you’re looking for a fun afternoon for the family or a leisurely soak for those sore legs after a day of mountain biking, Steamboat’s hot springs are the perfect way to put an exclamation point on the ultimate Colorado summer getaway. Located in town, Old Town Hot Springs offers hot springs-fed pools, two waterslides, a climbing wall, and a fitness center. In the summer, the addition of a party deck, cabana rentals, and the Wibit, an inflatable obstacle course, make this a great place to spend the day. The swimming and soaking pools of Old Town Hot Springs served as a gathering and bathing place for the Ute Indians who first settled in the area. In the late 1800s, it was a social spot for the early homesteaders. Today, the family-friendly facility is the place for recreation and rejuvenation for visitors and locals alike. Kids will love the waterslides and rock-climbing wall. A kiddie pool, lap pool, fitness center and adults-only spring make this the perfect family destination. Go for a swim here to check off #6 on the 2019 Summer Boat List. The Old Town Hot Springs is located conveniently downtown at Third Street and Lincoln Avenue, accessible by lodging shuttles or the Steamboat Springs Transit free bus. Holding true to what makes them so unique, the Strawberry Park Hot Springs blend pure nature with unique stone masonry in an incredible setting. Soaking in the therapeutic 104 degree water is the perfect way to unwind from your adventure-filled day. Head out of town for the most breathtaking experience in Colorado at Strawberry Park Hot Springs. Nestled in an aspen grove in the mountains about 15 minutes from downtown Steamboat, the wilderness setting highlights the rustic beauty of the Yampa Valley. Several hot pools of varying temperatures are fed by the natural spring water and the rushing Hot Spring Creek. Four-wheel drive is recommended for the rugged but beautiful drive there. In the summer, campsites, sheep wagons and cabins are available for a rustic camping experience, and heated cabins are available to rent in winter. Massages and watsu round out this ultimate spa experience. Access Strawberry Park Hot Springs by a short drive or take an all-inclusive shuttle service that will take care of everything for you.